Thyroid cancer starts in the thyroid gland, a butterfly-shaped gland located under the Adam's apple in the front of the neck. According to the American Cancer Society, approximately 43,210 new cases of thyroid cancer were diagnosed and more than 1,780 people died from the disease in 2012. Treatment of thyroid cancer includes surgery to remove all or most of the thyroid and possibly the lymph nodes in the neck, I-131 radiotherapy, external beam radiation therapy, chemotherapy, and thyroid hormone therapy. New developments in molecular imaging technologies are dramatically improving the ways in which thyroid cancer is diagnosed and treated. Research in molecular imaging is also contributing to our understanding of the disease and directing more effective care of patients with thyroid cancer. What is molecular imaging and how does it help people with thyroid cancers? What molecular imaging technologies are used for thyroid cancer? The most commonly used molecular imaging procedure for diagnosing and guiding the treatment of thyroid cancer are radioiodine scans and positron emission tomography (PET) scanning, which is often used in conjunction with computed tomography (CT) scanning. I-131 radiotherapy is also used to treat thyroid cancer after the thyroid is surgically removed. What is a radioiodine scan and how is it performed? Radioiodine scanning involves using a small amount of radioactive iodine and a gamma camera to detect cancer cells. The patient either swallows a capsule of I-123, which is absorbed by the thyroid gland and thyroid cells located elsewhere in the body. Using a gamma camera, the front of the patient’s neck (or the entire body for a whole-body scan) is imaged several hours later to determine how the radioactive iodine has accumulated. Areas of the thyroid that absorb more iodine than surrounding tissue are called hot nodules and are not cancerous. Areas that absorb less iodine are called cold nodules and may be cancerous. However, cold nodules may also be benign. As a result, the radioiodine scan alone cannot be used to diagnose thyroid cancer. Radioiodine scans are often used in conjunction with a biopsy to determine whether a patient has thyroid cancer. In addition, whole-body, I-131 radioiodine scans are very useful to determine whether the cancer has spread throughout the body. A 65-y-old woman with thyroidectomized papillary thyroid carcinoma in follow-up. 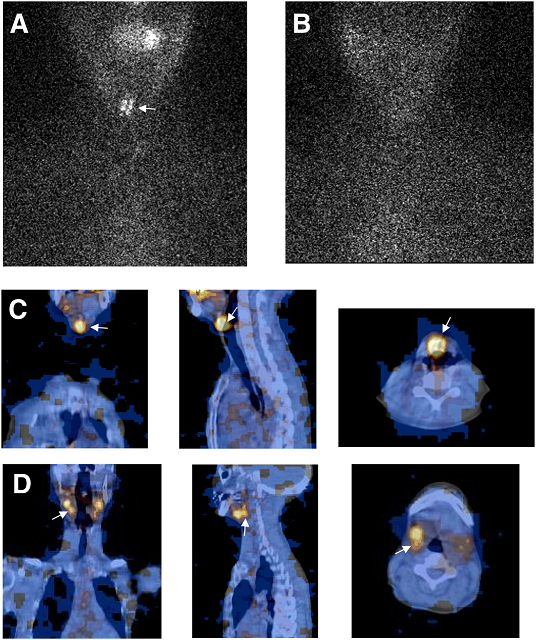 (A) and (B) show planar 131I imaging of neck and chest with 1 focus of radioiodine uptake. SPECT/CT (C) confirm residue seen on planar imaging but also show metastasis in (D). Diagnosis was definitively confirmed at surgery, revealing papillary thyroid carcinoma lymph node metastasis. PET involves the use of an imaging device (PET scanner) and a radiotracer that is injected into the patient’s bloodstream. A frequently used PET radiotracer is 18F-fluordeoxyglucose (FDG), a compound derived from a simple sugar and a small amount of radioactive fluorine. In I-131 radiotherapy, the radioactive material used is radioactive iodine I-131. The patient swallows the radioactive iodine in either liquid or pill form, which accumulates in and destroys both healthy and diseased thyroid cells. What are the advantages of I-131 high-dose radiotherapy for people with thyroid cancer? What is the future of molecular imaging and thyroid cancer? Clinical trials are underway to evaluate the use of the radiopharmaceuticals yttrium-90 labeled octreotide and indium-111-octreotide to treat patients whose thyroid cancer has spread to other parts of the body and is not responsive to treatment with I-131 radiotherapy.